I spent Christmas in Australia with my family. It was my first Christmas there in 5 years and I was so excited to go. We didn’t meet at home; instead, our family travelled to Queensland near where my Dad’s sister and niece live. I hadn’t seen my cousin since 2002, and had never met her husband or two daughters – so it was quite the reunion! My parents, sisters, brother-in-law and I all stayed in apartments by the beach at Surfers Paradise. Mum got lots of brownie points for finding such a great place at an affordable price. The view from our units was pretty amazing! It was us, a road, the beach, and then the Pacific Ocean all the way to the horizon. Amazing view from the top-floor apartment! We did a lot of swimming, in the ocean and in the pool. It was heavenly!! 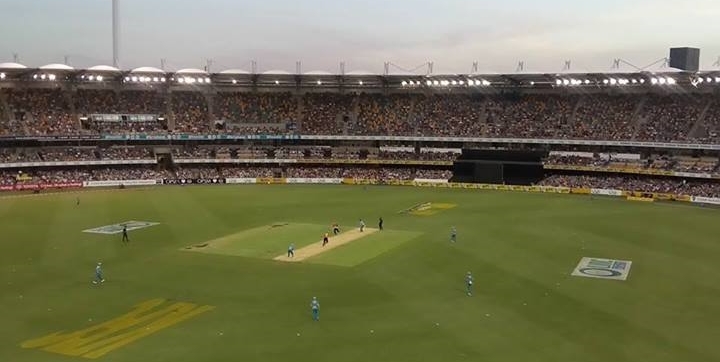 I even got to go to a Twenty20 cricket match (the “Big Bash League” season opener) at the ‘Gabba with my parents and sister. I hadn’t been to a cricket match since before leaving for China 10 years ago so it was a lot of fun. Christmas was a lot of fun, too. My cousin even found a balloon place that would make and deliver a balloon Christmas tree! It was festive and fun and a perfect place to stash the pile of presents. As always at a Crossman Christmas there were piles of desserts (despite Mum’s best efforts to prevent sugar overdoses!) including pavlova, cheesecake, jelly shots, and an ice-cream “plum pudding”. Next we drove south to my grandparents’ place. The road wove in and out of view of the ocean, and was for the most part quite pleasant. Of particular interest to me were the fields of sugar cane we passed. I’d never before considered how bamboo-like it is in appearance. The south-east of Queensland has pretty perfect conditions for sugar cane; almost all of Australia’s sugar cane is grown there. Sugar cane has been grown in Australia ever since the first English settlers arrived and is now a significant export crop. Later, we drove past The Big Banana at Coffs Harbour. I suppose I can cross that off the bucket list now….? I had two short days at my grandparents’ home in Singleton before travelling to Sydney with my Aunt and Uncle so I could catch my plane to Cambodia. We ran into traffic soon after leaving the highway and took an alternate route down back streets. This unplanned meander was one of the highlights of my trip. We were close to the part of Sydney I grew up in; the suburban gardens were full of trees and plants that reminded me of childhood. Not just the plants themselves, but the mixture of native and introduced species that I now suppose must be fairly peculiar to the Sydney area. It was amazing how simply looking at gardens took me straight back to childhood! Gum trees and paperbarks mixed with firs and privet hedges, lots of different banksia and grevillea and wattle trees, tropical frangipani and bouganvillea, agapantha and hydranger, and much more bright-coloured introduced flora. As it turned out, I didn’t leave until the next day. A minute before leaving for the airport I decided to check my email one last time and found a message that my flight was postponed until the next morning! I was able to stay with my Aunt and Uncle for the evening, and my Uncle even got up at early o’clock to drive me to the airport which was very sweet and much appreciated.